Having never wandered in such an area, I would like to go see it closely. QUESTION: How to get close to it? Taking the ferry from Ishigaki to Kohama then walking sounds like the easiest, but I am not sure one can "see" a mangrove on foot. The best would probably be kayaking/canoeing, I guess, but I haven't found any rental place. Alternatively, are there more accessible mangroves accessible as a day trip from Ishigaki city? Kayak rental. Based on my rough estimate from Google maps, the mangrove is about 7km/4mi away. That would be an easy round trip for an experienced kayaker, I think, but it may be a bit far if you are a novice. (Caveat: IANAK - I am not a kayaker, so please make sure you get more experienced advice before attempting something like this!) I don't know whether it would be possible to rent a kayak and transport it somewhere else. 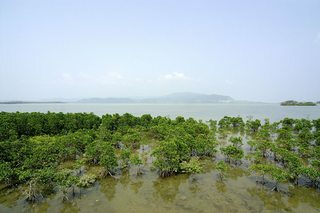 A nature tour that includes seeing the mangrove. I suspect there may be other options, as well, but perhaps not easily findable in English. There is a town in the southwest corner of the island, which has a hotel and other tourist amenities. I would not be at all surprised if it were possible to rent a kayak or other watercraft there. This would be much closer to the mangrove--perhaps 2km/1.5mi. Update: there are also packaged day tours of Kohama Island that leave from Ishigaki. Perhaps you can find one of these that includes touring the mangrove. Not the answer you're looking for? Browse other questions tagged japan nature-and-wildlife islands water-sports okinawa or ask your own question. When and how to see the Red Crabs on Christmas Island? Can I stop at Amami on the ferry between Okinawa and Kagoshima without having to pay more? Can visitors enter the inner caldera of the double volcano island Aogashima, Japan?